a natural opening or passage, especially one into or through a bone. apical foramen an opening at or near the apex of the root of a tooth. auditory foramen, external the external acoustic meatus. auditory foramen, internal the passage for the auditory (vestibulocochlear) and facial nerves in the petrous part of the temporal bone. 1. a blind opening between the frontal crest and the crista galli. 2. a depression on the dorsum of the tongue at the median sulcus. condyloid foramen, anterior hypoglossal canal. condyloid foramen, posterior condylar canal. ethmoidal foramina, fora´mina ethmoida´lia small openings in the ethmoid bone at the junction of the medial wall with the roof of the orbit, the anterior transmitting the nasal branch of the ophthalmic nerve and the anterior ethmoid vessels, the posterior transmitting the posterior ethmoid vessels. incisive foramen one of the openings of the incisive canals into the incisive fossa of the hard palate. interventricular foramen a passage from the third to the lateral ventricle of the brain. intervertebral foramen a passage for a spinal nerve and vessels formed by notches on the pedicles of adjacent vertebrae. jugular foramen an opening formed by the jugular notches of the temporal and occipital bones. foramen mag´num a large opening in the anterior inferior part of the occipital bone, between the cranial cavity and spinal canal. mastoid foramen an opening in the temporal bone behind the mastoid process. foramen of Monro interventricular foramen. obturator foramen the large opening between the pubic bone and the ischium. omental foramen the opening connecting the greater and the lesser peritoneal sacs, situated below and behind the porta hepatis; called also epiploic foramen. 1. the septal opening in the fetal heart that provides a communication between the atria; it normally closes at birth. Failure to close results in an atrial septal defect. 2. an aperture in the great wing of the sphenoid for vessels and nerves. The fully developed embryonic heart showing the foramen ovale and ductus arteriosus. From Copstead and Banasik, 2000.
petrosal foramen, foramen petro´sum a small opening sometimes present behind the foramen ovale for transmission of the lesser petrosal nerve. foramen rotun´dum a round opening in the great wing of the sphenoid for the maxillary branch of the trigeminal nerve. sacral foramina, anterior eight passages (four on each side) on the pelvic surface of the sacrum for the anterior branches of the sacral nerves. sacral foramina, posterior eight passages (four on each side) on the dorsal surface of the sacrum for the posterior branches of the sacral nerves. Scarpa's foramen an opening behind the upper medial incisor, for the nasopalatine nerve. sciatic foramen either of two openings (the greater and smaller sciatic foramina), formed by the sacrotuberal and sacrospinal ligaments in the sciatic notch of the hip bone. 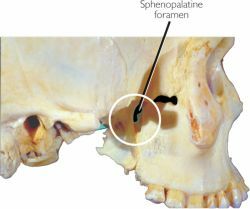 sphenopalatine foramen a space between the orbital and sphenoidal processes of the palatine bone, opening into the nasal cavity and transmitting the sphenopalatine artery and the nasal nerves. spinous foramen a hole in the great wing of the sphenoid for the middle meningeal artery. supraorbital foramen passage in the frontal bone for the supraorbital vessels and nerve; often present as a notch bridged only by fibrous tissue. thebesian foramina minute openings in the walls of the right atrium through which the smallest cardiac veins (thebesian veins) empty into the heart. transverse foramen the passage in either transverse process of a cervical vertebra that, in the upper six vertebrae, transmits the vertebral vessels. vena cava foramen an opening in the diaphragm for the inferior vena cava and some branches of the right vagus nerve. foramen veno´sum an opening occasionally found medial to the foramen ovale of the sphenoid, for the passage of a vein from the cavernous sinus. vertebral foramen the large opening in a vertebra formed by its body and its arch. foramen of Vesalius foramen venosum. Weitbrecht's foramen a foramen in the capsule of the shoulder joint. foramen of Winslow epiploic foramen. /fo·ra·men/ (fo-ra´men) pl. fora´mina [L.] a natural opening or passage, especially one into or through a bone. apical foramen of tooth an opening at or near the apex of the root of a tooth, giving passage to the vascular, lymphatic, and neural structures supplying the pulp. auditory foramen, external external acoustic meatus. auditory foramen, internal a passage for the auditory and facial nerves in the petrous bone. foramen of Bochdalek pleuroperitoneal hiatus. 2. a small triangular expansion at the lower border of the pons, formed by the termination of the anterior median fissure of the medulla oblongata. 3. a depression on the dorsum of the tongue at the median sulcus. cotyloid foramen a passage between the margin of the acetabulum and the transverse ligament. epiploic foramen an opening connecting the two sacs of the peritoneum, below and behind the porta hepatis. esophageal foramen see under hiatus. ethmoidal foramina , fora´mina ethmoida´lia small openings in the ethmoid bone at the junction of the medial wall with the roof of the orbit, the anterior transmitting the nasal branch of the ophthalmic nerve and the anterior ethmoid vessels, and the posterior transmitting the posterior ethmoid vessels. infraorbital foramen a passage for the infraorbital nerve and artery. interventricular foramen a communication between the lateral and third ventricles. intervertebral foramen a passage for a spinal nerve and vessels that is formed by notches on pedicles of adjacent vertebrae. jugular foramen an opening formed by the jugular notches on the temporal and occipital bones. foramen of Key and Retzius an opening at the end of each lateral recess of the fourth ventricle by which the ventricular cavity communicates with the subarachnoid space. lacerate foramen, anterior an elongated cleft between the wings of the sphenoid bone, transmitting nerves and vessels. lacerate foramen, middle f. lacerum. lacerate foramen, posterior jugular f.
foramen la´cerum a gap formed at the junction of the great wing of the sphenoid bone, tip of the petrous part of the temporal bone, and basilar part of the occipital bone. foramen of Magendie a deficiency in the lower part of the roof of the fourth ventricle through which the ventricular cavity communicates with the subarachnoid space. foramen mag´num a large opening in the anterior inferior part of the occipital bone, between the cranial cavity and vertebral canal. nutrient foramen any of the passages admitting nutrient vessels to the medullary cavity of bone. obturator foramen the large opening between the os pubis and ischium. olfactory foramina any of the many openings of the cribriform plate of the ethmoid bone. 1. (of sclera) lamina cribrosa (3). 2. (of sphenoid bone) see under canal. 1. a fetal opening between the heart's atria. palatine foramen, greater the lower opening of the greater palatine canal, found laterally on the horizontal plate of each palatine bone, transmitting a palatine nerve and artery. palatine foramina, lesser the openings of the lesser palatine canals behind the palatine crest and the greater palatine foramina. quadrate foramen f. venae cavae. foramen rotun´dum os´sis sphenoida´lis a round opening in the great wing of sphenoid for the maxillary branch of the trigeminal nerve. Scarpa's foramen an opening behind each upper medial incisor, for the nasopalatine nerve. sciatic foramen either of two foramina, the greater and the lesser sciatic foramina, formed by the sacrotuberal and sacrospinal ligaments in the sciatic notch of the hip bone. 1. a space between the orbital and sphenoidal processes of the palatine bone, opening into the nasal cavity, and transmitting the sphenopalatine artery and nasal nerves. stylomastoid foramen an opening between the styloid and mastoid processes for the facial nerve and the stylomastoid artery. supraorbital foramen a passage in the frontal bone for the supraorbital artery and nerve; often present as a notch bridged only by fibrous tissue. thebesian foramina minute openings in the walls of the right atrium through which the smallest cardiac veins empty into the heart. 1. an inconstant opening in the thyroid cartilage, due to incomplete union of the fourth and fifth branchial cartilages. foramen ve´nae ca´vae an opening in the diaphragm for the inferior vena cava and some branches of the right vagus nerve. vertebral foramen the large opening in a vertebra formed by its body and arch. foramen of Vesalius an occasional opening medial to the foramen ovale of the sphenoid, for passage of a vein from the cavernous sinus. foramen of Winslow epiploic f.
zygomaticofacial foramen the opening on the anterior surface of the zygomatic bone for the zygomaticofacial nerves and vessels. zygomaticotemporal foramen an opening on the temporal surface of the zygomatic bone. An opening or orifice, as in a bone or in the covering of the ovule of a plant. fo·ram′i·nal (-răm′ə-nəl), fo·ram′i·nous (-nəs) adj. an opening or aperture in a membranous structure or bone, such as the apical dental foramen and the carotid foramen. An aperture or passage through a bone or a membranous structure. A natural hole in a bone for the passage of a nerve, artery or a vein or other anatomical structure. A small opening, perforation, or orifice. n a naturally occurring opening in human bones or membranous structures that allows the passage of nerves and blood vessels. n 1. a natural opening in a bone or other structure. 2. a natural opening in the root, usually at or near the apical end. n the opening entryway at the root's apex, from which the blood vessels and nerves radiate out to the rest of the tooth. Often located within a range of several millimeters of the precise anatomic high point of the root. n a small, pit-like depression in the dorsal surface of the tongue where the median lingual sulcus meets the lingual tonsil. n a small opening of the hard palate located near the second and third molars in which the palatine vessels and greater palatine nerve travel. n (nasopalatine foramen), 1. the opening of the incisive (nasopalatine) canal marked by the incisive papilla. 2. the foramen, or opening, in the midline of the palate in the region where the premaxilla and maxillae join, which is situated palatal to the maxillary central incisors; contains branches of the right and left nasopalatine vessels and nerve. n a small opening in the maxilla at the terminal end of the infraorbital canal. Its location can be roughly approximated by mapping the intersection of an imaginary straight line drawn between the eyes and the nose. n a small opening that can be present in the midline of the mandible through which an artery connecting to the sublingual right and left lingual arteries travels. Cannot be noted radiographically. n an opening in the occipital bone through which the spinal cord enters the spinal column. n an opening on the medial aspect of the vertical ramus of the mandible approximately midway between the mandibular and gonial notches; may be located posterior to the middle of the ramus. It carries interior alveolar vessels and the inferior alveolar nerve. n an opening on the lateral aspect of the body of the mandible inferior to the apices of the mandibular second or first premolar. The mental vessels and nerve pass through this foramen to travel through the mandibular canal to supply the lip. In edentulous mandibles, the bone may have been resorbed, so that it is in such a position that the denture base will cover it. n 1. an oval-shaped opening located between the two atria of a developing fetal heart. 2. an oval-shaped opening located in the sphenoid bone in which travels the mandibular nerve, emissary veins, accessory meningeal artery, and otic ganglion. n a round opening located in the sphenoid bone in which travels the maxillary nerve. pl. foramina [L.] a natural opening or passage, especially one into or through a bone. a foramen which perforates the wing of the atlas in some species and transmits the vertebral artery; appears as a notch in dogs. the opening at or near the apex of the root of a tooth and into the dental cavity. the passage for the auditory (vestibulocochlear) and facial nerves in the pars petrosa of the temporal bone. Called also internal acoustic meatus. the caudal opening into the greater palatine canal. one of the three openings in the diaphragm; situated in the central tendinous part of the diaphragm; called also vena caval foramen, foramen venae cavae. a blind opening between the frontal crest and the crista galli. an occasional finding in humans; marks the boundary of the caudal and rostral contributions to the tongue, the site of the origin of the thyroid gland; called also cecum foramen. an opening connecting the omental bursa with the rest of the abdominal cavity; situated on the visceral surface of the liver dorsal to the portal fissure. Called also foramen of Winslow. rare cause of acute intestinal obstruction in horses. one of the openings of the incisive canals into the incisive fossa of the hard palate. the facial opening of the infraorbital canal, a prominent feature of the lateral aspect of the face; provides a point of emergence for the infraorbital nerve. a passage from the third to the lateral ventricle of the brain. a passage for a spinal nerve and vessels formed by notches on the pedicles of adjacent vertebrae. an opening formed by the jugular notches of the temporal and occipital bones. the irregular gap between the basioccipital, petrous temporal and sphenoid wing bones, making up a large, membrane-covered foramen in horses, but reduced to a slit in other domestic mammals. a large opening in the occipital bone, between the cranial cavity and spinal canal. in the medial surface of the mandible; inferior alveolar vessels and nerve enter here. one of the foraminae ventral to the orbit; leads to the infraorbital canal. foramina on the lateral aspect of the mandible from which the inferior alveolar nerve and blood vessels emerge to supply the chin. an opening in the temporal bone behind the mastoid process. the entrance for the nutrient artery of a bone. the large opening between the pubic bone and the ischium. the opening into the optic canal. transmits ophthalmic branch of trigeminal, oculomotor, abducent and trochlear nerves. Called also orbital fissure. the copy, in pigs and ruminants, of the orbital foramen in other species. 1. the septal opening in the fetal heart that provides a communication between the atria. 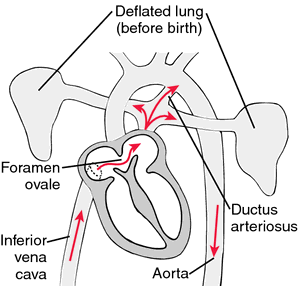 The opening closes at birth; failure to close results in atrial septal defect. greater and lesser foramina in the hard palate for conduction of palatine vessels. apertures in avian bones which connect with air sacs making pneumatization of bone marrow cavities possible. opening in the septum primum between the two atria of the embryonic heart; called also ostium primum. the external opening of the temporal canal just caudal to the zygomatic arch; this foramen provides an exit for a large vein, the transverse sinus which drains the cranial cavity. a round opening in the great wing of the sphenoid for the exit of the maxillary branch of the trigeminal nerve from the cranial cavity; in ruminants it is combined with the orbital fissure. passage on the dorsal surface of the sacrum for the dorsal branches of the sacral nerves. passage on the pelvic surface of the sacrum for the ventral branches of the sacral nerves. an opening behind the upper medial incisor, for the nasopalatine nerve. either of two foramina, the greater and the lesser sciatic foramina, formed by the sacrotuberal and sacrospinous ligaments in the sciatic notches of the hip bone. the second of the two orifices to perforate the septum primum between the cardiac atria; forms through cell death. Called also ostium secundum. a space between the orbital and sphenoidal processes of the palatine bone, opening into the nasal cavity and transmitting the sphenopalatine artery and the nasal nerves. a hole in the great wing of the sphenoid for the middle meningeal artery. the opening of the facial canal, adjacent to the ear from which the facial nerve emerges. a fissure in the mediodistal part of the humerus in cats through which the median nerve and vessels pass. passage in the frontal bone for the supraorbital vessels and nerve; often present as a notch bridged only by fibrous tissue. minute openings in the walls of the heart through which the smallest cardiac veins (thebesian veins) empty into the cardiac chambers. the passage in either transverse process of a cervical vertebra that, in the first six vertebrae, transmits the vertebral vessels. the hole between the ends of the avian clavicle, coracoid and scapula that transmits the tendon of the supracoracoid muscle and serves as a fulcrum to lever the wing upwards. an opening in the diaphragm for the caudal vena cava. 1. the large opening in a vertebra formed by its body and its neural arch. an occasional opening medial to the foramen ovale of the sphenoid, for passage of a vein from the cavernous sinus.